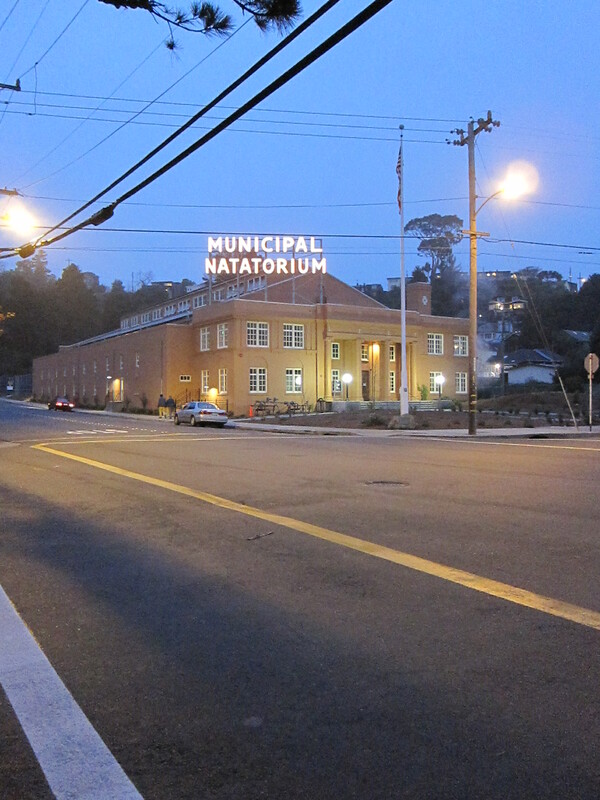 The public swimming pool in Point Richmond reopened with a grand celebration recently. In the interior, the beautiful structure is washed with daylight, and a floor to ceiling mural at one end by John Wehrle really completes the experience. I took a photo of the huge lighted sign the other night because it amused me. Maybe more buildings should be clearly labeled like this. I’ve considered it for my house, in part because I like to paint. The street numbers could be 8″ high and painted in glow in the dark paint. We could bring in a new era of sign painting arts and put neon sign makers to work. I’m not sure all the signs should be mounted at an angle to the building like this…and they could be slightly more subtle perhaps….but they should all be as beautiful as possible. No shiny plastic. Swimming at the Richmond Plunge has been a true delight. Thank you for this beautiful photo. No problem Jessica. I still need to check out the inside.